Sewing and baking and snowing, oh my! The weekend. Well, it started early. I got to leave work at 4:20, since I had already hit 40 hrs, the phone hadn’t rung, and I got all my work done. So, naturally, I went to Target. Didn’t find anything… but I had the opportunity, and I seized it. We polished off leftovers and watching The West Wing. A perfect Friday night. Saturday morning, we slept in. When we woke up, there was a text from our friends asking us to join them for breakfast! So we all went, and it was so fun. I woke up feeling pretty sniffly, and wasn’t surprised because just about everyone I’ve spent time with this week is SICK. So, that’s awesome. I didn’t get any cleaning done, but I finished the Gilmore quilt and started the Sylvias quilt (which is so fluffy I’m gonna die, AND nearing completion, which has me in shock. I super de duper love that sewing machine!). 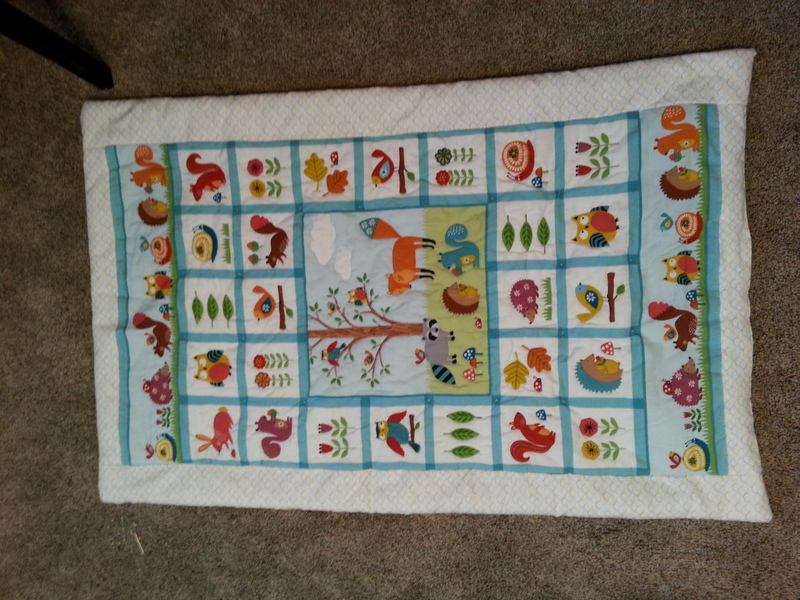 The Gilmore Quilt Front I hand-stitched around all the little animals, except for the long strip on the top and the long strip on the bottom. 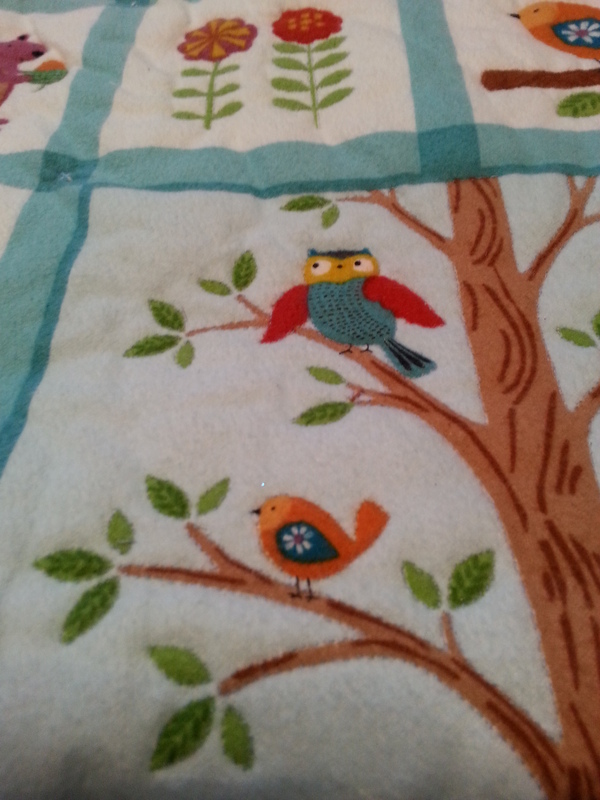 Stitching around them made them puffy, so it gives the blanket more texture and makes the animals RIDICULOUSLY ADORABLE. 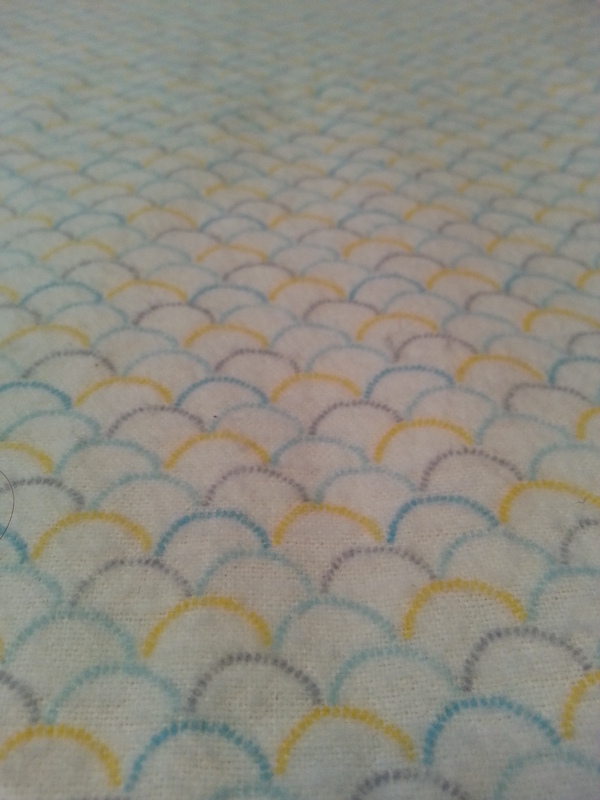 This is the fabric framing the front, and the pattern on the back. I mean seriously, I’m biased, but I think this is adorable. I caught up on my TV shows, and sat in bed for the parts of the day I wasn’t at the table sewing. Josh brought home brownies, Ben and Jerry’s for me, and vanilla (I meant vanilla ice cream, but he thought I meant vanilla extract which was comical) and then we ordered Pizza. We watched Charade, with Cary Grant and Audrey Hepburn, enjoyed some Hawaiian pizza from Pappa John’s, and halfway through the movie we made brownies (which I insisted on cutting with our heart shape cookie cutters) and enjoyed them with ice cream. Yes, it was Valentine’s… and it was full of love. No, this Valentine’s Day was not all about romantic love, and I think that is clear in how it was spent. 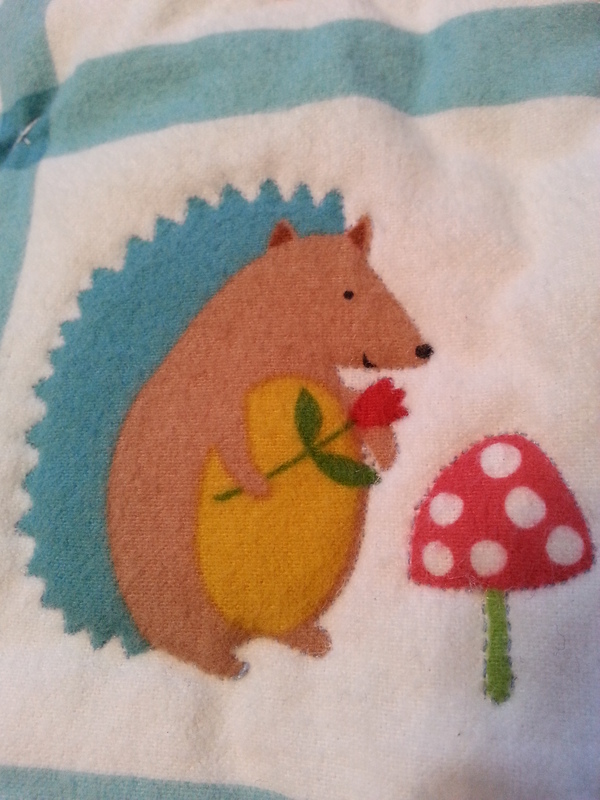 Working on blankets for my friend’s babies. Giving my husband the freedom to spend the day in the library. Spending time with my husband and Aaron, making sure we didn’t exclude Aaron. Sunday morning, I woke up and knew I wasn’t going to make it to church. My sweet husband made my breakfast, and I stayed at home in bed all morning, resting. The afternoon held lots of The West Wing, sewing, and snuggling. We made ham and potato chowder for dinner, which was perfect considering the freezing weather. Right now, I’m at work… feeling sick, wishing I was at home in my nice warm bed. I’m counting down the minutes until I can leave… worrying about the work I’m going to miss because of the impending snow storm, and trying to decide what movie to watch when I get home. 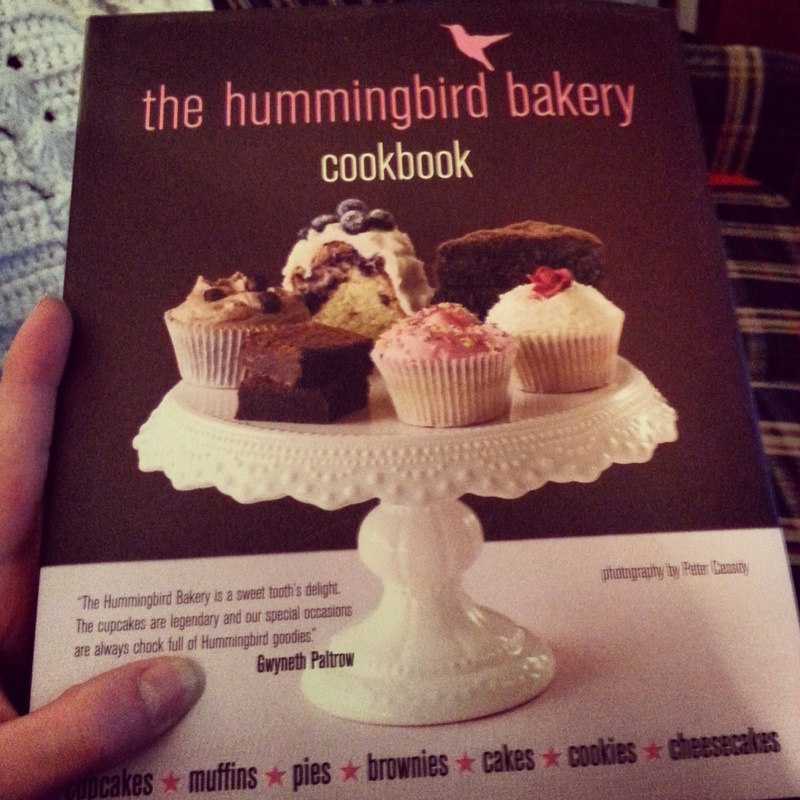 I can’t wait to bake yummy things from my cookbook! That was such a thoughtful gift. Thank you for helping me make the soup last night. I know Aaron didn’t like it, but I appreciated your help and your praise. Also thanks for taking care of me, which includes telling me that I don’t have to stress about getting 40 hours in at work if it’s not possible. Please pray for the rest of my work day today. It feels like 5pm is never going to come, and my lunch made me feel sick… it’s not you, it’s Mexican leftovers.